I took a red-eye flight home from our Ragnar race in Seattle so that I could be home when my parents arrived on Monday afternoon. I caught a weird cold and was pretty wiped out from the lack of sleep. Cute little Halle took care of the boys all morning—fed them breakfast, played with them and kept them upstairs while I caught a few hours of sleep. 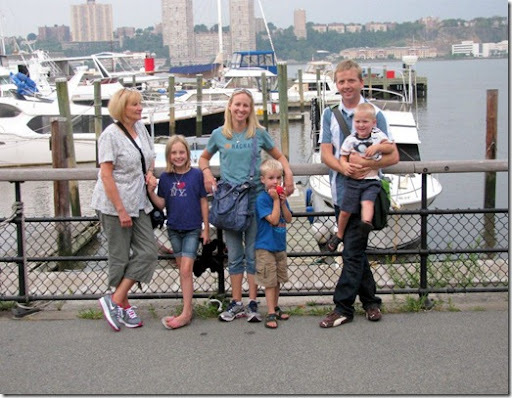 The kids couldn’t wait for Grandma and Grandpa to get there so they could show off their NYC prowess. 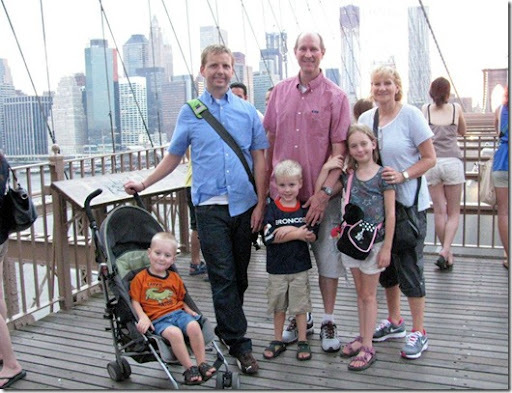 My dad had only ever spent 1 night in NYC, so he was excited to see all the sites, and we were happy to oblige. They got in around dinner time, so we headed down to the Boathouse Café on the Hudson River for dinner. The food wasn’t fabulous, but it was affordable, and the view was incredible. 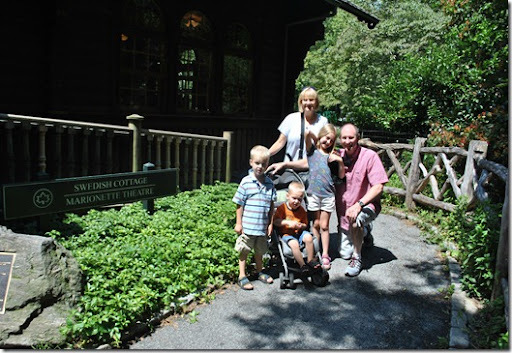 The next morning we headed to Central Park and took the kids to the Swiss Cottage Marionette Theater to see “Miss Muppets Monster Sitting Service.” It was super cute. We then toured around Central Park a little bit, going through Shakespeare Gardens and Belvedere Castle. 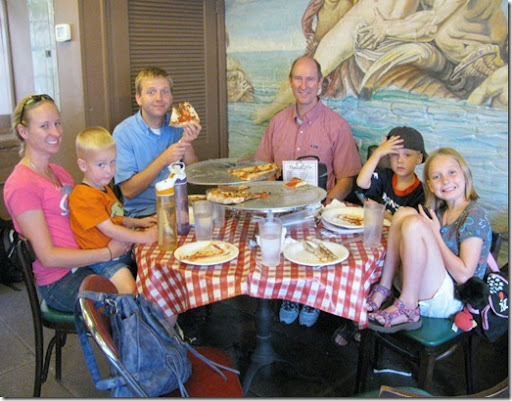 That evening we hit up Lombardi’s Pizza for dinner—they boast that they are the oldest pizza joint in Manhattan. We sat in a little room that was down a hallway, past the kitchen, and up some stairs. I was kinda afraid we were going to be part of some Italian Mob hit…. 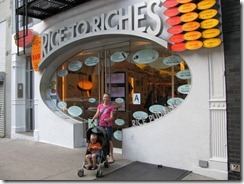 My Dad has been dreaming of dessert at Rice to Riches ever since he saw the pics from Rusty’s birthday. So, my belated Father’s Day gift to him was many flavors of rice pudding. 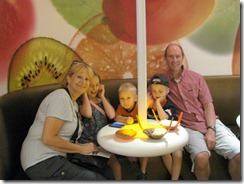 We had 6 different flavors, and enjoyed them all. The store signage is so funny. It’s worth going just for the humor, even if you don’t like Rice Pudding. We ended the day on the Brooklyn Bridge. Josh had been so excited to do this again. He had been keeping one of his athletic shirts clean for about a week so he would have it to wear when we did the Brooklyn Bridge. I noticed that he was acting sad and ornery and so I asked him what was wrong. He said, “I have been looking forward to RUNNING across the Brooklyn Bridge for such a long time and Dad said I couldn’t because I would be too far away from him.” So, cute little Josh and I ran all the way across the bridge. He tearing through the crowds and almost being mowed down by bicycles, me following behind apologizing to everyone in his wake. Of course we beat everyone to the end, and he couldn’t have been more proud. It was adorable.